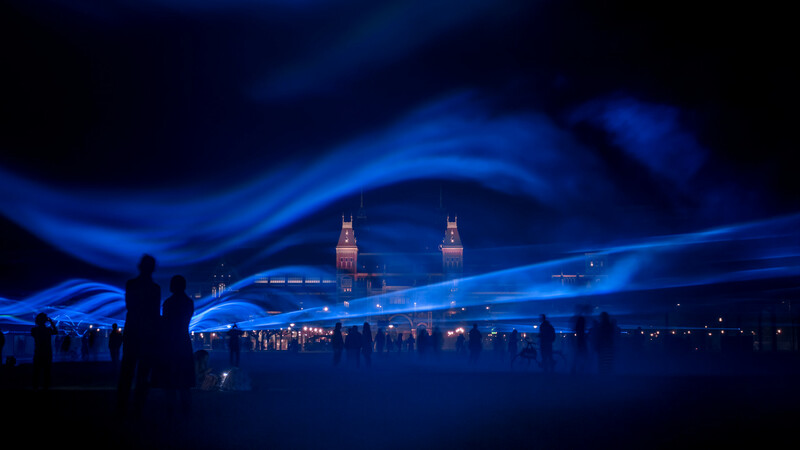 Daan Roosegaarde’s WATERLICHT is a spatial LED installation that illuminates how high water levels can reach in a world impacted by climate change. Below is a brief analysis of the functions and qualities of light used in WATERLICHT. The WATERLICHT in a way treats the spatial environment its deployed in as its performer. The LEDs used primarily serve the function of modeling the space to highlight the performer’s form as if it were flooded. The wavy light plane created by the LEDs add the hypothetical water surface above the audience’s head, reshaping a familiar public space and helping the audience imagine a wet future. This lighting effect also serves a compositional purpose in conveying the rising waters story too. Also, one of WATERLICTH’s themes is “water innovation”, so the meditative, flowing nature of overhead lightwaves certainly match that theme’s contemplative mood. I personally think it’s the qualities of WATERLICHT’s lights that allow the installation to serve its functions well. This is especially true for the light’s distribution, texture, and movement qualities. Distribution is key because WATERLICHT needs to effectively flood the public space. The light flows aboves everyone’s head throughout the entire space, submerging the audience. Projecting a wavy and almost continuous texture with a tide-like movement is necessary to complete the light plane as water levels metaphor. Also the bluish and greenish LED colors echo water’s natural colors.